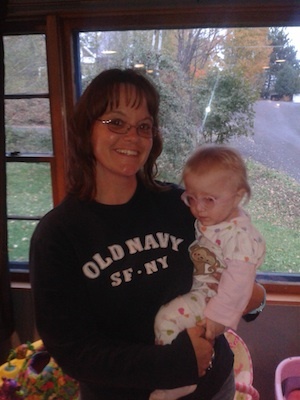 Did you know that 1 in 2500 babies are born with Dandy-Walker Syndrome? Unfortunately, 54% of these babies will become angels within the first four weeks of life and another 32% by six months. Researchers estimate one person out of every 30,000 lives with Dandy-Walker. Dandy-Walker is characterized by abnormal development of the cerebellum in the brain. There are three types of Dandy-Walker: variant (mildest form), malformation, and syndrome (most severe form). Dandy-Walker affects the brain—in my daughter Madilyn’s case she has a very tiny deformed cerebellum which causes balance and gross motor issues. She also has a VP shunt for hydrocephalus (fluid build up on the brain because her ventricles don’t work properly) and a slight deformity on the back of her skull that is covered by her hair. We keep hearing that “on paper” Madilyn should basically have the mentality of an infant, she shouldn’t know anyone or anything, or be able to do the things she does. 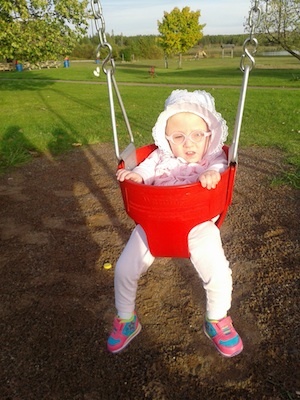 In reality she’s motoring all over, learning to talk and is delayed but happy and thriving. We have feeding issues, and most recently a kidney ultrasound showed us that Madilyn has deformed kidneys that contain two collecting duct systems rather than one. She also has kidney stones, but her blood work shows that her kidneys are functioning normally. We are adding Renal to our list of specialists that we see (they will be #8) and will meet them for the first time during our November trip to the children’s hospital. There are no two people in the world with Dandy-Walker that experience the same symptoms. Some people live their entire lives never knowing they have it. Babies die from unknown causes because they were born seemingly healthy at full term with never a suspicion that something was wrong. Others spend years wondering why they have balance issues or other problems, only to finally have an MRI done and the diagnosis of Dandy-Walker to answer their questions. Is Dandy-Walker really an answer? In my opinion it at least gives it a name. Other than that, it tells us nothing and nobody really knows anything about it—the brain is so complex and so many things can be rerouted that doctors have no way of telling us what to expect. It can wreak havoc on the entire body, it causes problems with other organs, muscle tone and strength, vision, feeding, speech, and development. No two people are alike. Up until this point we have felt very, very alone and frustrated in our Dandy-Walker life as most people have never heard of it. Recently, thanks to the internet, I have found a whole world of us. I can read and reread a million times the medical sites and government statistics on Dandy-Walker, but absolutely nothing compares to reading another post or having a chat with another parent/person who is living it. It gives us comparisons and inspires new ideas to push our children to progress and achieve new milestones. A parent of a child with Dandy-Walker (or any other parent of a child with special needs) is forced to think outside the box on a daily basis; we are forced to become the MacGuyver of medical contraptions to figure out what aids and benefits our children the most. We live in a world where we have no comparisons. Nobody can tell us when or if our child will ever reach milestones. It can be incredibly frustrating and lonesome, and at the same time tremendously rewarding. 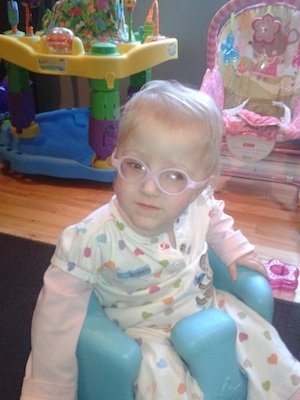 Our little Madilyn Rose and her diagnosis of Dandy-Walker has taught us to never ever take anything for granted. Each day you wake up and can open your eyes is a blessing; each milestone and smile is applauded, praised and cheered. Each new word and discovery for Madilyn is celebrated, usually with happy tears and a bombardment of my Facebook page because I want the whole world to know. In the same token, a cold is never just a cold. A setback is just another bump in the road and absolutely nothing is the end of the world. She has taught me patience, compassion and an entirely new level of unconditional love. She has taught us to choose the positive every single day, and that all the medical terminology and gadgets just make me smarter, and the new specialists give me a chance to make new friends. Though our life is full of struggles—financial and emotional—I absolutely love it. Madilyn is such a blessing in our lives and so are her new little pink shoes. For more information about Dandy-Walker, please visit the Dandy-Walker Alliance.